I'm the Technology Editor at Forbes India and I love writing about all things tech. Explaining the big picture, where tech meets business and society, is what drives me. I don't get to do that every day, but I live for those well-crafted stories, written simply, sans jargon. Walmart Inc has signed definitive agreements to become the largest shareholder in the Flipkart Group, in a transaction that values Flipkart at $20.8 billion (around Rs 1.4 lakh crore). The investment “underscores Walmart’s commitment to sustained job creation and investment in India, one of the largest and fastest-growing economies in the world,” the US company said in a press release on Wednesday. Subject to regulatory approval in India, Walmart will pay approximately $16 billion (around Rs 1 lakh crore) for an initial stake of approximately 77 percent in Flipkart, formally Flipkart Private Limited. The remainder of the business will be held by some of Flipkart’s existing shareholders, including Flipkart co- founder Binny Bansal, Tencent Holdings Limited, Tiger Global Management LLC and Microsoft Corp, Walmart said in its press release. This implies that the other co-founder Sachin Bansal (unrelated to Binny Bansal) will sell all his stake in the ecommerce company he founded in 2007. “India is one of the most attractive retail markets in the world, given its size and growth rate, and our investment is an opportunity to partner with the company that is leading the transformation of the ecommerce in the market,” Doug McMillon, Walmart’s president and chief executive officer, said in the press release. India was a “critical market” for Walmart, he added. According to Forrester, the Indian online retail market was around $20 billion in 2017 (2.4 percent of total retail market in India). No other market except China and US can compete in terms of total retail opportunity. Forrester projects the online retail market in India to reach $73 billion by 2022. In the fiscal year ended March 31, 2018, Flipkart recorded gross merchandise value(GMV) of $7.5 billion and net sales of $4.6 billion representing more than 50 percent year-over-year growth in both, according to the press release. Currently, Walmart India operates 21 Best Price cash-and-carry stores and one fulfilment centre, across 19 cities in nine Indian states, with more than 95 percent of sourcing coming from India. In a presentation to investors, Walmart said that with Flipkart, there’s an opportunity to tap the latter's strong foundations in India, become the lowest cost operator and offer differentiated customer service. The American company sees India as its only other “key growth market” apart from China, while America remains its core market, with a clutch of other markets comprising other growth opportunities — such as in Africa and Latin America. 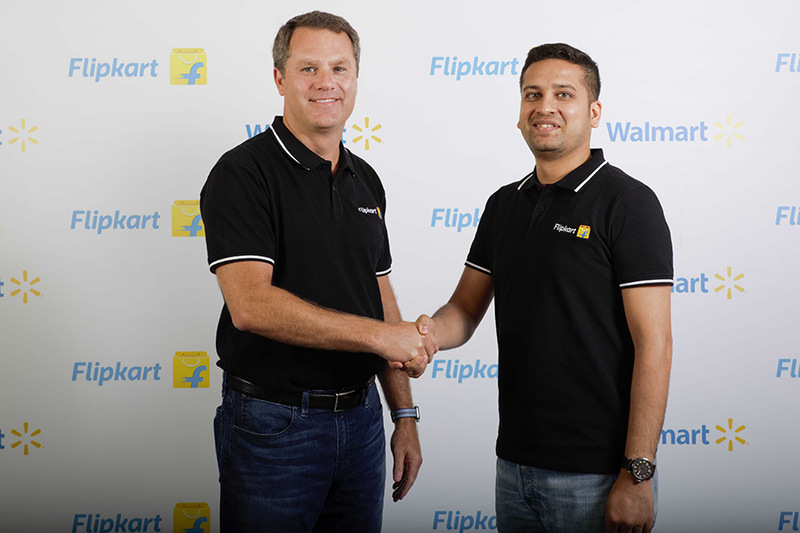 The Flipkart transaction is an exercise in marrying “local talent with global expertise,” Walmart said. Flipkart had 54 million active users in a market where there were 443 million millennials and about two-thirds of the country’s 1.3 billion population comprises the so-called ‘Generation Z’ or those who were typically born from the mid-1990s onwards. India is also the second largest internet market in the world, by number of users — the first being China. India is also unique in that 79 percent of its internet users access the net via the mobile phone, whereas the proportion is about 50 percent for the global average. The company cited a report by consultancy Bain and Co. to point out it was entering a market where total retail is set to grow at about 9 percent whereas ecommerce is projected to surge ahead at a rate of 36 percent, growing four-times faster. Penetration would triple from today’s 2.1 percent to 6.2 percent in the year 2023, therefore leaving a massive opportunity for further growth by achieving deeper online commerce penetration. Walmart and Flipkart are also in discussions with additional potential investors who may join the investment round, which could result in Walmart’s investment stake moving lower after the transaction is complete. Even so, the company would retain clear majority ownership. Tencent and Tiger Global will continue on the Flipkart board, joined by new members from Walmart, according to the release. The final make-up of the board has yet to be determined, but it will also include independent members. The board will work to maintain Flipkart’s core values and entrepreneurial spirit, while ensuring it has strategic and competitive advantages, Walmart said in the release. The transaction includes a $2 billion infusion of fresh equity investment into Flipkart, enlarging its war chest as it gears up for a three-way fight for India’s retail market against Amazon on one side and China’s Alibaba Group on the other, which has backed Flipkart’s local rival One97 Communications that operates both India’s largest mobile wallet service and an ecommerce marketplace under the brand name Paytm. “For Flipkart, this deal is more than just money,” said Forrester’s Meena. To remain the number one player in India (Amazon coming a close second in just four years in India), they are looking to expand beyond smartphones and fashion. This deal with Walmart can provide Flipkart the expertise of running offline stores, access to sellers and manufacturers, supply chain and the know-how to get into the grocery segment, he said. While the immediate focus will be on growing the business, “Walmart supports Flipkart’s ambition to transition into a publicly-listed, majority-owned subsidiary in the future,” the Bentonville, Arkansas-based company said in the release. The current transaction is expected to close later this calendar year, subject to regulatory approvals.